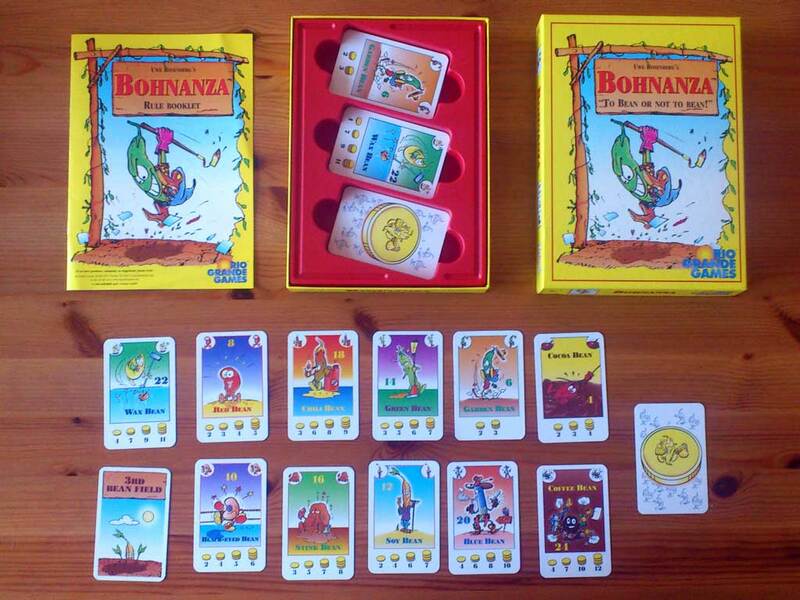 Bohnanza is a competitive farming game with each player assuming the role of a bean farmer. Gameplay consists of planting/selling beans, visiting the market and trading with other players to try and offload unwanted goods. 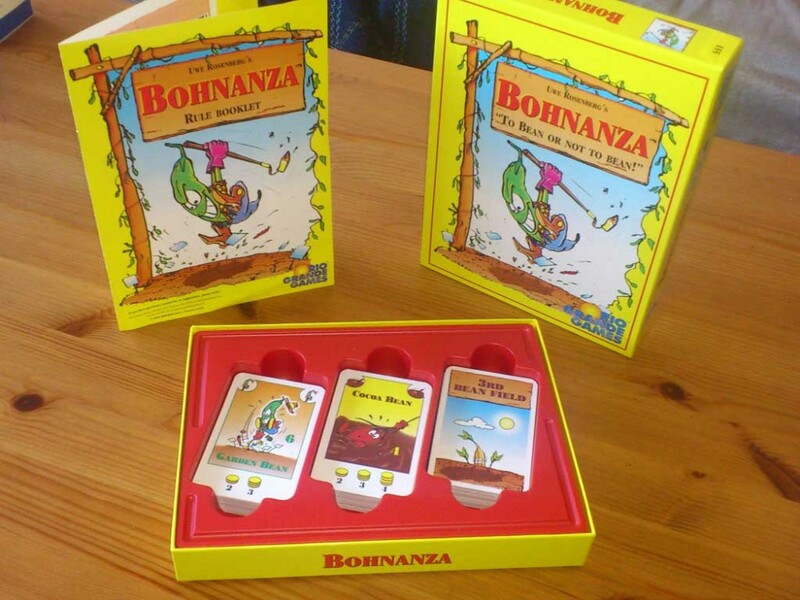 This may sound like a typical trade game, but Bohnanza offers a surprising amount of strategy thanks to a brilliant and simple game mechanic that you just don’t see very often. Lets take a quick look at the gameplay. 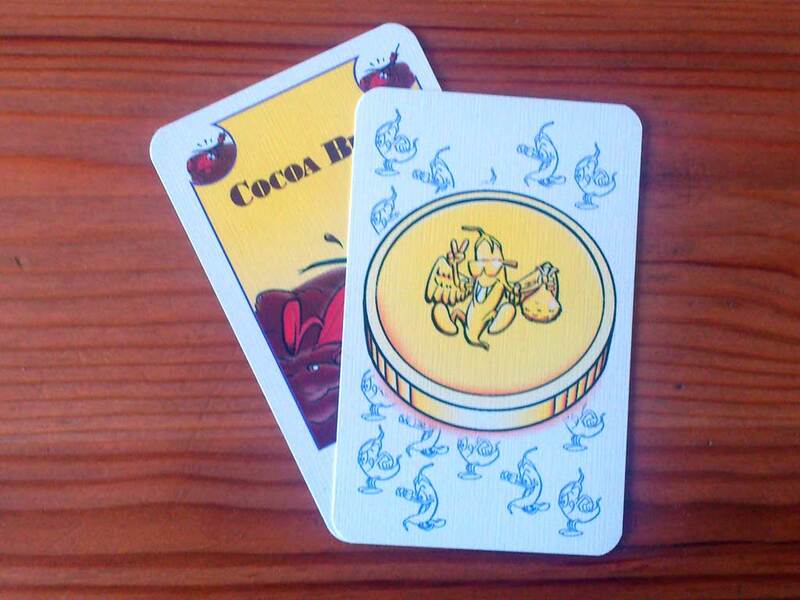 Each player has access to their own private bean fields. Players start with two fields each and each field can only support one bean type at any one time. A player’s turn will consist of 2 phases (Planting/Harvesting and Trading) and gameplay is handled entirely by cards. The Trading phase consists of revealing some cards from the draw deck and deciding if you want to keep them yourself (you have to plant them if you do) or opening up trading with other players. Sounds simple doesn’t it – almost boring in fact. Luckily, there are a few excellent twists. 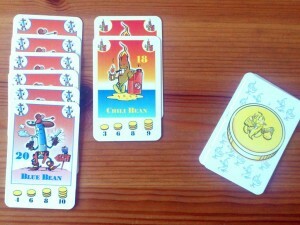 Players must plant a bean on every turn and they must plant their beans in the order received. This is where the game’s key strategy element comes in. At the start of play, players are dealt a hand of cards at random. Players cannot reorder these cards – the first card you are dealt is the first card you must plant. Want to move your cards around to keep all your runner beans together? Well tough luck – you can’t! Not only that, you must plant something on every turn and it has to be the first card in your hand. If your fields are full and the card you’re planting is a different type, then you have no choice but to harvest one of your fields first in order to make room for the new one. [one_half last=”no”]Making money in this game relies on you planting multiples of the same type of bean in the same field. For example, you would need to have planted 4 coffee beans in order to make 1 gold. It can be heartbreaking to cull a field of beans before they have made you any money, but you will have very little say in the matter. It can be heartbreaking to cull a field of beans before they have made you any money, but you will have very little say in the matter. During the trade phase, cards are revealed from the draw deck. If it’s your turn, you have to plant the revealed cards. Alternatively, you can offer the cards to other players, often in exchange for cards from their hand (which again, must be planted immediately). So how does this work? Lets say John has just revealed two coffee beans. John doesn’t want these, but Olly does. In exchange for the coffee beans, Olly can offer some beans he doesn’t want (such as wax beans, which John DOES want) . John accepts and plants the wax beans. Olly then takes the coffee beans and plants them. Win-win. Not only did John get some cards he wanted, but Olly was able to get rid of some unwanted cards from his hand, thus bringing his next coffee bean to the front of his deck ready for planting on his turn. Once this is over, John draws some more cards from the deck and they go into his hand. Its important to note that you can offer trades from anywhere in your hand, not just those cards at the front. You still can’t change the order of the cards in your hand, but at least you can get rid of unwanted beans. Of course, the trading deals can get more convoluted than that example and plenty of fun can be had when all players try to get in on the trades. In short, keeping the cards in the order received may feel strange in a card game, but it adds an intelligent wrinkle to an otherwise simple game and it plays out brilliantly. The game’s presentation is basic, but perfectly matched to the gameplay. The artwork isn’t going to blow you away, but it’s fun and functional, with the various bean types shown as cartoons on the cards. Particularly amusing are the “Coffee bean” doing several things at once and the rather depressed looking “Stink bean”. Amusing artwork aside, I can’t help thinking that the presentation was missing something and you may struggle to get the game to the table because of this. The cards themselves are cleverly designed, with the bean trade in values shown on the bottom and a number at the top showing how many beans of that type are in the deck (a low number means a rare bean!). The reverse of the cards represent money – just flip the cards when your harvest them and keep an appropriate number of them as your cash. This might strike you as a bit frugal, but there really is no need for the game to include any extra pieces and the simplicity of the setup was appreciated. This game seemed to go down well with non-gamers and has provided plenty of entertainment once it hit the table. The lackluster presentation and the farming theme may make this a tough sell however. Interestingly, this game seemed to go down less well when playing with a group of seasoned gamers, so your mileage may vary depending on who you play with. Overall we found this to be a great game and its certainly worth your consideration – you will probably want to play before you buy however as it may not be to everyone’s taste. This is a fun game and definitely worth checking out. Some may be put off by the theme and the presentation, but you are in for a fun time if you can get the game to the table. Is it worth buying? Maybe. A lot of the appeal of this game lies in the unusual mechanic and the banter you can have with the other players so your mileage will vary depending on who you play with. This game has gone down very well with our friends and family, but less so at our regular gaming group. We say try before you buy.